The Adventure 17 is an excellent starter boat for sailing newcomers and a fantastic day boat for enthusiasts. With a more familiar Bermudan rig and alloy spars, she bears all the characteristics of the outstanding Cornish Crabber range. 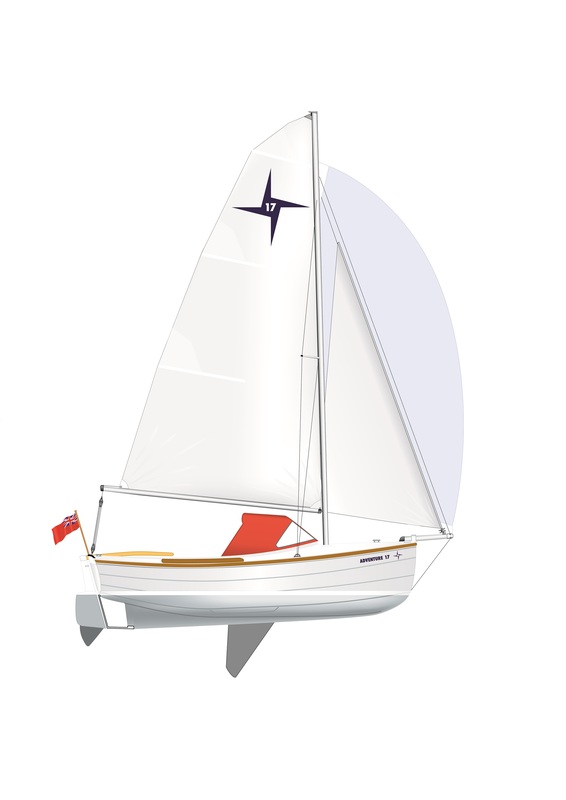 The spacious self draining cockpit can be immediately transformed into a light spacious cabin with two berths and abundant stowage, by raising the fold-down spray-hood. The Adventure 17 can be easily launched or retrieved single-handed from her custom built road trailer and accommodates up to five for day sailing. A great option for those of you who would like the option to trail, sail and then stay onboard. As with all our boats the Adventure 17 can be moulded in your choice of colour and specified with your choice of extras for a truly unique boat which will hold her value for the future. Deck Fittings: Bespoke deck fittings including bow sprit and chain plates are made from stainless steel. 4 aluminium deck cleats are positioned aft & amidships with two fairleads feeding a hard wood Sampson post forward. All sail controls are led aft to rope clutches / jammers with a single halyard winch to starboard. Adjustable jib & mainsheet cars. Cockpit Lockers: Two main watertight lockers with latches and padlocks are provided.